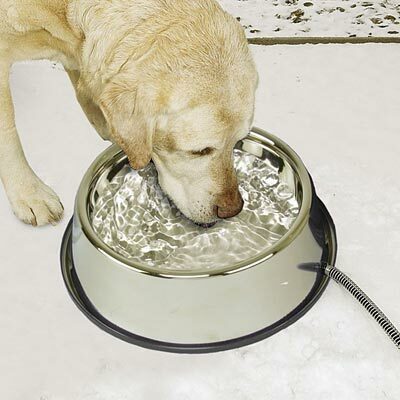 Ensure your dog has water available through the winter with the K&H Stainless Steel Heated Pet Thermal Bowl. This hardy, stainless steel bowl keeps 2.75 quarts of water available for your medium to large dog, outdoor cats, or other wildlife, allowing them to remain hydrated even on the coldest days. The hidden heating element uses only 25 Watts of power, warming the bowl and preventing water from freezing, even in sub-zero temperatures. A plastic base and ring around the bottom of the bowl keep the item stable on a level surface, and the 70" long power cord runs the enclosed heating element. A steel spiral covers the cord, preventing animals from chewing on it, while the all metal body is simple to clean and refill. Provide water to your outdoor pets in this Stainless Steel Heated Pet Thermal Bowl. One year limited warranty.